Originally posted: January 5, 2016 . Last modified: April 20, 2019 . 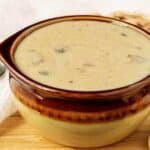 Cream of Chicken Soup Substitute is quick, easy, and a great way to add flavor and depth to casseroles. A good way to replace canned condensed soup. I know. I know. You don’t have to say it. This post is not at all exciting or spectacular. It’s not the latest or greatest recipe. Nope. It sure isn’t. Instead, it’s about cream of chicken soup substitute. Nothing overly special there, but it is a required ingredient in many, many recipes. I thought it was necessary to share this recipe because you never know when it might come in handy. I’ve cooked several casseroles that require condensed soup. In fact, casseroles probably wouldn’t be the same without it. So, while this cream of chicken soup substitute may not be a dish you can make over the weekend and have leftovers for Monday’s lunch, you will be able to learn how to prepare this impressive standby in case you are in a pinch. Never in a million years did I ever think I’d be explaining to anyone how to make cream of chicken soup substitute. You may be wondering why in the world anyone would want to make it when canned soup is readily available in supermarkets everywhere. I started making it because I don’t particularly like canned soup. It’s also good to know what you’re cooking with and be able to control the flavors, consistency and sodium content. There’s only been one time in my entire life when I remember purchasing a can of condensed soup. If I recall correctly, it was used to make green bean casserole, and it wasn’t something I cared to buy again. Even if you aren’t like me and have nothing against canned soup, it’s a good idea to have as a standby in case you don’t have the condensed soup you need. Cream of chicken soup substitute is a great recipe to use in a pinch, and no one will be able to tell the difference. I use it every time I make hash brown casserole, and it works beautifully. This recipe only takes a few minutes to make. It begins with a few spices and ends with what is essentially a flavorful roux. The great thing about this recipe is that you can increase the amount (double or triple) and store the unused portion in the fridge for up to a week. If your recipe only calls for one can of condensed soup, this recipe is pretty spot on. It can be used on a one to one ratio. I’ve used this cream of chicken soup substitute in a handful of recipes, and it works well. You can adjust the spices to meet the flavors of the dish. If you need more garlic taste, add more garlic powder. Maybe more onion, add extra onion powder. It’s that simple. Give it a try the next time you are in need of condensed soup. You may never buy canned again. If you like this cream of chicken soup substitute recipe, please leave us a comment and rate the recipe card. You can also find us on Facebook, Pinterest, Twitter and Instagram searching for Berly’s Kitchen! 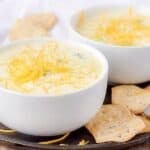 This cream of chicken soup substitute is quick, easy, and a great way to add flavor and depth to casseroles. A good way to replace canned condensed soup. In a small bowl, whisk together milk and flour. Be sure to break up any lumps. In a medium saucepan, combine broth, spices, salt, and pepper. Allow to come to a simmer on low-medium heat. Whisk the broth and slowly add the milk and flour mixture. Continue to whisk for 2-3 minutes until mixture begins to thicken. The mixture will continue to thicken as it cools. Use immediately or store in an airtight container in the refrigerator for up to a week. Funny story! Before I even started a blog, let alone met you in the blogging community, I used this recipe (from your blog!) when I needed cream of chicken soup in a pinch. Belated thank you!! I just made your cream of chicken soup for subbing for the can. I like this better. But I also used in the Pressure cooker XL under the soup label. I will use this whenever I make or need soup. Another useful post, thanks. I love your site. I try to use store bought soups as little as possible. This could be very handy. Im one of those that buys it canned 🙈 need to start making it myself. How would you recommend editing this to make cream of celery or cream of mushroom? I have breast cancer and I need to make diet changes of less processed foods whenever possible. I’ll definitely be using this cream of chicken in my old favorite recipes but we also make a lot of things that use cream of celery and mushroom! Would you think sautéing celery/mushrooms in olive oil first and stir them into a basic rue? Hi Alisha! For cream of mushroom, add 1/2 cup to 1 cup finely chopped mushrooms (depending on how chunky/thick you want the soup). Cook those down first with a small amount of butter, then add the broth, spices, and roux. For the cream of celery, it’s the same as the mushroom. Add 1/2 to 1 cup finely chopped celery depending on how thick of a soup you like and how heavy of a celery taste. Follow the same directions as above for the rest. 🙂 You could also swap out the chicken broth for veggie broth, but it will change the flavor some. Thanks for the question! Best wishes for your health! Found your recipe and plan on trying it tonight as my chicken divan base. Question for you is would this amount be about the equivalent of a can of cream of chicken soup, as I need two? Hi, Valddie! Yes, this recipe makes approximately the same amount of cream of chicken soup that’s in one can (about 10.5 ounces). It’s easy to double if you require more. Thanks for stopping by and have a great afternoon! This worked perfectly! Tasted great, and now my crock pot pork chops will taste even better without the canned stuff! THANK YOU! 10 for 10 will absolutely use again! Thanks for the fantastic recipe! It just makes me feel dirty to buy canned “Cream of Whatever” soups. We are trying our best to eat healthy, but every so often you want a version of a comfort food.